Your pet needs the best of the best! Don't settle for anything less. Give your sweet little fur baby something that will make them purr or make their tail wag. The tapered bowls have a nice wide lip that has multiple embossed pawprints, while the bottom of the bowl has one large embossed pawprint. These stainless steel pet bowls are easy care, sturdy and perfect for the wear and tear of a furry friend. Don't worry about it getting broken by an excited pet ready to eat! 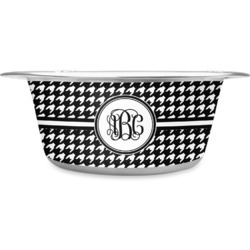 Our stainless steel dog bowls are personalized / customized by applying your custom printed label that wraps around the side of the bowl. Our labels or stickers are made from a high quality gloss vinyl, printed with eco-solvent inks, and are arc cut precisely by a machine to fit each bowl. The labels are waterproof and will hold up to daily use and will not fade over time. They come in three different sizes: Small, Medium, and Large. The small bowl holds about 2 cups of food, the medium holds 4 cups, and the large holds 8 cups. We recommend hand washing the bowls and only washing them in the dishwasher occasionally. Prolonged dishwasher washing will fade and impact the label / sticker. Need dishwasher safe dishes? Browse our ceramic pet bowls that are both microwave and dishwasher safe. 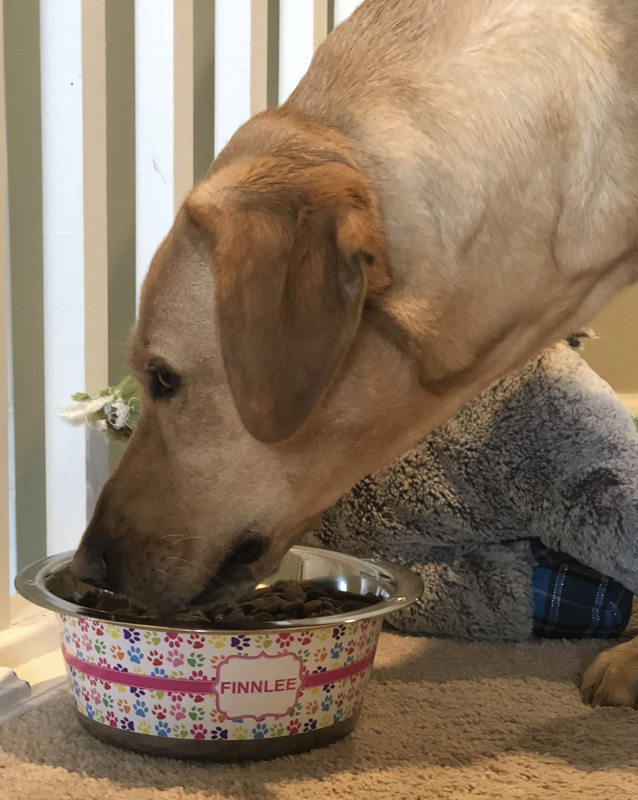 Don't forget the pet bowl mat and browse our customized / personalized pet accessories department to purchase your matching & coordinating accessories. Get into our design center. Look around, there's plenty to choose from. Check out the thousands of options when it comes to design elements. You get to pick EXACTLY what you want on your design! Have fun with it! If you need any help, just ask us. We have your back! Love the pineapples & hibiscus flowers on her bowls. They look great & are the perfect size too. Ordered 3 stainless pet bowls with different pictures, names & background colors. Website was easy to use, plus showed good image of what each product would look like. Items arrived very quickly & are perfect. Stainless bowls are the rather thin ones - not extremely so, but not the real solid heavy ones either. So they appear to be decent quality. Color, image & lettering are excellent. I ordered these as gifts & am thrilled with the result. May need to order more for my own pets.